Storing media like photos, music, and video on your iPhone is a snap: after all that’s what the device was designed for. But when it comes to carrying around other types of documents, or files that aren’t in your iTunes or iPhoto library, the iPhone falls woefully short. You can always send PDFs, Microsoft Word documents, and Excel spreadsheets to yourself, but since the Mail app lacks a search function, finding the one message with the file you want often means picking through long lists of e-mails. A trio of worthwhile programs have sprung up to fill this void, allowing you to store and view documents of your choice on the iPhone or iPod touch. It's strictly a "look, don't touch affair," though, since the iPhone’s software does not yet allow editing of these documents. While each program takes a slightly different approach to getting files on your phone, all have their own strengths and weaknesses depending on what your intended uses are. All three applications require that your mobile device and computer be on the same Wi-Fi network in order to transfer files and all three have roughly similar performance, both in transferring and viewing files, except in the cases noted below. I Call Your Name: Olive Toast's Files lets you filter your files based on name. 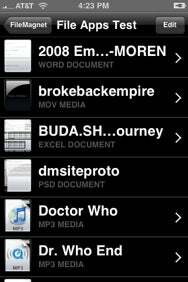 Olive Toast Software’s Files struck me as the most iPhone-like of the applications I tested. It works by running a WebDAV server that you can connect to from either Windows or OS X; once connected, you can copy files to it like any other remote server. The status of the WebDAV server is denoted in Files by the color of a circle icon in the bottom left corner of the interface. (Green means on, red off, and orange no Wi-Fi network detected.). Tapping the icon lets you easily start or stop the server. The app’s preferences, accessible via the gear icon in the top left, lets you set a username and password to prevent others from accessing your files, or enable guest access if you want others to be able to pass your documents around. Files has a number of built-in features that make it a snap to use. For example, there’s a magnifying glass icon that you can tap to bring up a Filter field: Type in a string, and it’ll automatically show you only files whose name matches the characters you entered. When you’re viewing files, a handy toolbar at the bottom of the screen allows you to jump to the beginning or end of a document and also gives you access to one of Files’s other handy features: bookmarks. You can add internal bookmarks to long documents and then jump to them later; Files will also remember where you left off reading in a multi-page file and start at that point if you open the file later. My only gripe with the toolbar at the bottom of the screen is that it disappears automatically after a second. It’s convenient when you’re scrolling through a file, but I’d rather have the option to hide or show it with a single tap like many other applications use. When you’re viewing a picture, the Files toolbar also has a button that's labeled “Add to iPhoto”, but that's a little misleading. While the app seemingly tries to add the photo to your phone’s Camera Roll, it didn’t work in my tests. The image showed up in the thumbnail of the Camera Roll in the Photos app, but not in the Camera Roll itself. Files handles many of the types of document you can view in Mail, like Word docs, PDFs, images, audio and video, even Safari WebArchives—however, it falls down when it comes down to viewing iWork documents, showing them instead as folders. According to the documentation, you can work around this by compressing the files into .ZIP archives. In my tests that worked for Pages and Keynote files, but not for Numbers documents. In case you’re worried about getting carried away, Files allows you to set a disk quota limit. Unfortunately, Files only tells you how much space is being taken up by all the files in a given folder when you’re inside that folder; outside of the folder, it only tells you how many items are in that folder—not the total size—making it harder to keep track of where all your big files are hidden. DataCase, by Veiosoft, is very similar to Files, but sports some even more advanced features for power users. Instead of using a WebDAV server, DataCase lets you transfer files over the network via a variety of technologies, such as OS X’s native AFP, HTTP, or FTP. That makes it easy to connect from either your Mac or your PC. But in most cases you won’t need to fire up a client, since baked-in support for Apple’s Bonjour technology means that you don’t have to spend costly time inputting a server address: when you launch DataCase, your iPhone will show up in the Finder just like another computer on your network. Upon launch, DataCase's screen provides you with a handy donut-shaped graph that breaks down how much capacity is being used by different types of files you're storing in DataCase; it also provides a text breakdown below the chart (it doesn’t, however, reflect how much space your iTunes-synced media files are using, for example). And not only does DataCase let you view files in landscape orientation, you can also flip the phone to navigate DataCase’s interface lengthwise as well—helpful if you have long file names. Multi-Purpose: With DataCase, you can create multiple volumes each with their own permissions. DataCase allows you to create multiple volumes, each with their own read and write permissions, which is handy for power users, but has the potential to confuse beginners—for example, there’s no way to copy a file from one volume to another on the phone itself and there's no way to search all your volumes. 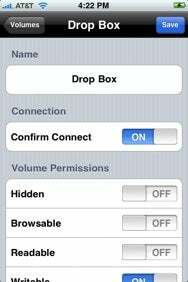 By default, one volume is set up as a Drop Box that other users can put files in but not read, and another is set up as a Shared Files volume that all users can write and read to. I found DataCase’s interface to be the least intuitive of the three; for example, from the main screen the only option, is to tap the folder icon in the donut hole, which isn't obviously a button. And while a Filter button lets you choose to view only a certain type of files (audio, video, pictures, and so on), it doesn’t provide the same name-searching capabilities that Files has. Plus, due to the subtle nature of the UI when you’re filtering, it’s easy to forget that you’re hiding some of your files. When in file viewing mode, DataCase adds toolbar controls that let you jump to the beginning or end of a document or page up and down. However, of three apps tested, DataCase had the least support for different file types. I would frequently found myself confronted by an error saying that the selected document could not be displayed. I also ran into an issue where any attempt to transfer files would crash the program, but reinstalling the app seems to have fixed those problems. The most obvious downside of this approach is that it means you can only transfer files with a Mac (the desktop software is not yet compatible with Windows, although the developers are planning to add that funcionality soon) and that you’ll need to have FileMagnet Uploader on any computer with which you want to transfer files. But a desktop-based application does confer certain benefits. For one thing, you can queue files to transfer later by dragging them into FileMagnet Uploader: the files will begin to upload as soon as you open FileMagnet on your iPhone. And files transferred to FileMagnet keep a representative thumbnail—Files and DataCase both show only generic icons—so it’s easy to browse a folder of images and find the one you're looking for, even if they have inscrutable names. Unfortunately, FileMagnet does not have the search or filtering capabilities of either of its competitors. Support Center: Of the three apps, FileMagnet supports viewing the most types of files. FileMagnet also has the best filetype compatibility of all three apps, reading not only Microsoft Office files, but iWork documents as well. It was the only one of the three apps I tested to display an RTF document with styled text. (Files displayed it as plain text and DataCase would not display it all.) The only file that caused FileMagnet to balk that Files and DataCase could read was a WAV file. I also ran into a repeated error message that FileMagnet was running low on memory when trying to view large images, but Magnetism Studios says this will be fixed in a forthcoming update. At the end of the day, which of these applications you decide to use will depend largely on what kind of use you plan to get out of them. If you spend a lot of time transferring files to and from Windows machines, then Files and DataCase will make your life a little easier. If the ability to view as many different types of files as possible on your iPhone is your priority, then FileMagnet has the others beat. Those looking to maintain multiple volumes with granular permissions should look to DataCase. All three apps are compatible with any iPhone or iPod touch running the iPhone 2.0 software update.